This bird looks and feels like a sandpiper and judging from the short legs and bill a small sandpiper at that. The buff, rust, and white fringes to the upperpart feathers and the yellowish legs work for only a few species, including Purple, Sharp-tailed, Least and Pectoral Sandpipers. I don't think Sharp-tailed Sandpiper can be elimimated given the view so we'll ignore it. A Purple Sandpiper would lack the rusty color around the head of our quiz bird, as well as the prominent white lines on the back. The main identification contenders then are Least and Pectoral Sandpipers. These two sandpipers of the genus Calidris are remarkably similar in appearance. From the angle of the bird in the photo the best way to separate these two is to check the primary projection, i.e., the distance between the tip of the longest tertial or secondary and the tip of the longest primary. Least Sandpipers have a negligible primary projection, with the tip of the longest primary falling about even with the tip of the longest tertial. Pectoral Sandpipers on the other hand have a substantial primary projection, with the tip of the longest primary well separated from the tip of the longest tertial. Our quiz bird has a lot of primary projection and is therefore a Pectoral Sandpiper. 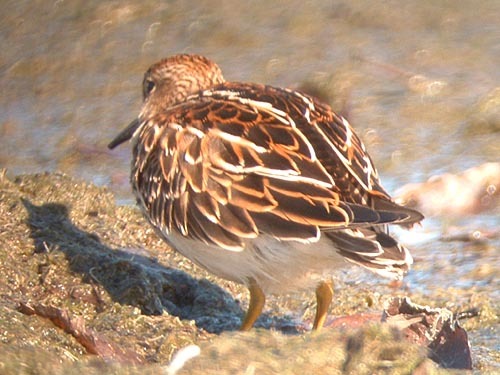 This Pectoral Sandpiper was photographed on October 5, 2004 at Montrose Beach in Chicago, Illinois.